Laptops are though good and portable Â for everyone who wants to keep working or connected to world wide web while on the move, they often get stolen if you are not careful. Stolen laptops pose grave danger if they have personal or professional data stored in them which generally is the case. Even though there are many paid applications are available to track down your stolen laptop, but today we will talk about a free and open sourceÂ applicationÂ which can help you track and find your laptop. You need to signup for it to login to web control panel. Signup is quite easy. You just need your email address. They will send you a activation mail to your email address. After that you need to add your laptop or desktop to control panel. 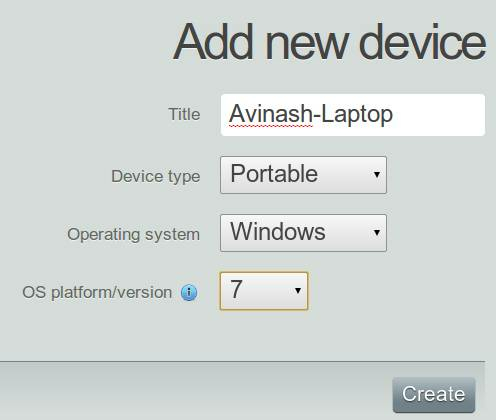 It will then provide you a device ID which you need to use it on your laptop or desktop. For doing that you need to install the Prey application on your system which available for Windows, Mac and even Linux. Wifi autoconnect â€“ Prey checks if thereâ€™s an active internet connection to send the information. Geo-location aware â€“ Prey uses wifi hotspots to locate devices geographically. This not only includes lat/lng coordinates, but also an altitude indicator. Lightweight – Prey is written in bash which means it has virtually no dependencies, only what it different modules need to work. This also means Prey is portable and should run in just about any computer. Modular architecture â€“ You can add, remove and configure the different parts of Prey as you wish. Prey is composed by modules, each one performing a specific task. Powerful report system â€“ Get the list of current running programs, the recently modified files, active connections, running uptime, take a screenshot of the running desktop or even a picture of the guy whoâ€™s using the computer. Messaging/alert system â€“ You can alert the thief Â heâ€™s being chased at by sending messages which will appear on screen. You can also trigger alarms to make the message clear not only to him but also to whomever is nearby. Module auto-installer â€“ You donâ€™t have to reinstall Prey to keep up with the latest and greatest modules. We keep a repository from where Prey will fetch what it needs to get the job done. Even though this application is free, it provides excellent features compared to paid products. Even after tracking a stolen laptop or desktop, its difficult to get them back but at least you are minimising your risks by using this. It works silently on your system and if stolen, the thief wont know that his movements are being watched.Â Obviously it needs a internet connection to work to track your your stolen laptop. After your desktop or laptop is stolen, it works sending timed reports with a bunch of information of its whereabouts. This includes the general status of the computer, a list of running programs and active connections, fully-detailed network and wifi information, a screenshot of the running desktop and â€” in case your laptop has an integrated webcam â€” a picture of the thief. PS: Giveaway winners of Democreator will be announced in few hours. Ð¯Ðº Ð·Ð½Ð°Ð¹Ñ‚Ð¸ ÑÐ²Ñ–Ð¹ Ð½Ð¾ÑƒÑ‚Ð±ÑƒÐº, ÑÐºÑ‰Ð¾ Ð¹Ð¾Ð³Ð¾ Ð²Ð¶Ðµ Ð²ÐºÑ€Ð°Ð»Ð¸ Ñ– Ð¶Ð¾Ð´Ð½Ð¸Ñ… Ð¿Ñ€Ð¾Ð³Ñ€Ð°Ð¼ Ð¿Ð¾Ð´Ñ–Ð±Ð½Ð¸Ñ… Ð¿Ñ€Ð¾Ð³Ñ€Ð°Ð¼ Ð¿Ð¾ Ð¹Ð¾Ð³ Ð·Ð°Ñ…Ð¸ÑÑ‚Ñƒ Ð½Ðµ Ð²ÑÑ‚Ð°Ð½Ð¾Ð²Ð»ÐµÐ½Ð¾. Ð”Ð¾ Ð¿Ñ€Ð°Ð²Ð¾Ð¾Ñ…Ð¾Ñ€Ð¾Ð½Ð½Ð¸Ñ… Ð¾Ñ€Ð³Ð°Ð½Ñ– Ð½Ð°Ð²Ñ–Ñ‚ÑŒ ÑÐµÐ½ÑÑƒ Ð½ÐµÐ¼Ð°Ñ” Ð·Ð²ÐµÑ€Ñ‚Ð°Ñ‚Ð¸ÑÑŒ, Ð±Ð¾ Ð²Ð¾Ð½Ð¸ Ñ‚ÐµÐ»ÐµÑ„Ð¾Ð½Ð¸ Ñ‡ÐµÑ€ÐµÐ· 3 Ñ€Ð¾ÐºÐ¸ Ñ‚Ñ–Ð»ÑŒÐºÐ¸ Ð·Ð½Ð°Ñ…Ð¾Ð´ÑÑ‚ÑŒ! How to find your laptop if it is stolen and any programs similar programs yogi protection not found. Law enforcement agencies make no sense even apply because they are phones in 3 years only to find!